Mijas Costa is the part of the former Mijas village that has spread down to the sea. This modern district contains two areas. Las Lagunas and La Cala, with commercial centres, an aquatic park and several golf courses, being Mijas Golf one of the most popular Golf courses on the Costa del sol. The most interesting monument in La Cala is an ancient watchtower, "El Torreon", which nowadays has been converted into a museum and centre for interpretation. Interesting as well is the "Hipodromo de la Costa del Sol", being an ideal place either for enjoying horse races, as well as to learn or practice riding. 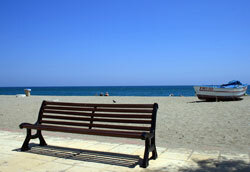 The town house of Mijas has quite a wide range of interesting activities to offer during the summer months. For instance, they give out free entrances for the Moldavia Orchestra, offer meditation courses, horse races alongside the beach, summer school courses, open air cinema, theatre and a chill out lounge with a different atmosphere, in the Ibiza style.